Evangeline Theopolis has nightmares about the violent deaths of women she has never met. Her single mother, Olivia, suffers delusions she can’t hide. And Malledy, a brilliant young man, may have a disease that will leave him paralyzed and insane. Their lives are about to collide. On Evangeline’s 16th birthday her mother gives her a necklace with an antique key charm—a family heirloom, though no one knows what the key unlocks. Everything changes. Her mom is hospitalized. Her godmother attempts murder. An ancient Order tries to kill Evangeline, and a lethal sect to kidnap her. Nothing makes sense—especially Evangeline’s own face, which has morphed from geeky to eerily stunning; the ancient key that feels strangely alive against her skin; and the magical abilities she begins to possess. Evangeline must use her wits and supernatural powers to fight her deadly adversaries and discover her true identity. But can she accept who she really is and save the world? Evangeline climbed a rickety wooden ladder into the hayloft. She wore a cotton nightgown she’d never seen before—ivory-colored with tiny pink roses, long enough to brush the tops of her bare feet…except they weren’t her feet, because they were too small and delicate and the nails were painted cherry-red. When she reached the loft, she found a lantern on the floor. Raising the glass top, she lit the wick with a match she hadn’t known she carried, and then turned the brass knob. The lantern glowed, illumining lazy dust motes, bales of yellowed hay, and a thick rope coiled in the corner. Evangeline tossed the free end of the rope over a rafter. She braced herself, leaned out from the ladder, and grabbed the dangling rope. Slowly her hands, which were not her hands because there was a pear-shaped diamond ring on the left ring finger, fashioned the end of the rope into a noose. I don’t know how to make a noose, Evangeline thought as she slid it over her head and tightened it around her neck. I was born on the east coast and went to Cornell University. After college I worked as a writer for Ringling Bros. Barnum & Bailey Circus. It was a fun first job and I learned how to write quickly, and also that when elephants sneeze on you it's very (VERY) messy. After a year in the circus, I moved out west. I lived in Aspen, Colorado where I skied as much as possible and worked as a waitress in a Mexican restaurant. Great experience but I learned that waitressing is hard (HARD) and I'm not very good at it. After Aspen, I moved to San Francisco, California where I worked as a writer for University of California, San Francisco and wrote freelance for LucasFilm. At UCSF I learned that sitting in a cubicle under fluorescent lights dulls my soul. LucasFilm taught me that writing freelance, especially fiction, is fun (FUN). So I headed to graduate school in Boulder, Colorado to further hone my skills. For the first part of my freelance writing career I wrote sport autobiographies. I'd visit and travel with an athlete like Monica Seles, Bela Karolyi, Nadia Comaneci or Apolo Ohno and then write their book. It was a terrific job, but after ten years and tons of incredible experiences I got tired of writing other peoples' stories and not my own. I've always loved books with adventure, magic, and dark forces. I'm a huge fan of Stephen King, Peter Straub, Neil Gaiman, Suzanne Collins and George R.R. Martin. Those writers allow a reader to lose themselves in stories that are intense, sometimes other-worldly, yet strangely believable. I feel incredibly lucky that now I have the chance to create books for readers that will hopefully captivate and transport them into a world where the supernatural is possible with characters that they can relate to who are flawed yet totally compelling. Today I live in the Pacific Northwest with my amazing husband, Henry, and our mostly loveable (but sometimes vorpal) Vizsla, Boone. When I'm not conjuring a story, I love to kite-board, bike, ski or plan adventures with Boone and Henry, who both make me laugh for different reasons and who are the best partners in fun a gal could ever imagine. Thanks so much to Suzanne for allowing me a coveted space on her blog! The work that bloggers do every day - reading and reviewing books, creating contests, giveaways, and visually super cool sites - really help authors find a niche and an audience. Much appreciated Suzanne!! A lot of readers have asked me about the process of writing Pandora's Key and if it was an easy one. I'd love to say YES! because that'd make me look good, but it wouldn't be truthful. Pandora's Key started off as a screenplay. I worked on the story for a year, and then spent another six months revising and editing before deciding that the story would work even better as a novel. And that's the thing about writing, at least for me, you have to be willing to let go of your precious words because they're actually not so precious and there are even better words to follow. And you have to be willing to drastically change or even kill off your characters in order to make a story rise above the ashes of a zillion past attempts and become incrementally better and hopefully one day really great. 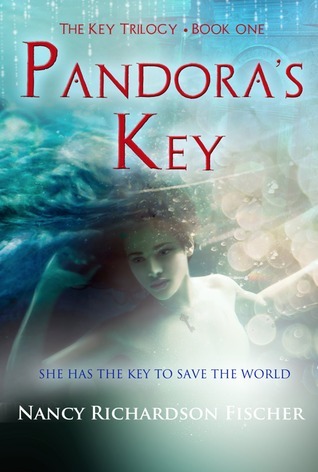 Once I decided to write Pandora's Key as a YA urban fantasy I spent another year writing and at least six more months editing my novel. Evangeline, my main character, isn't who I thought she was on day one of writing, or even on day three hundred! And Malledy? Jeeze, that kid evolved into who he is today seemingly without my input! Crazy, I know, but Malledy just knew who he wanted to be and told me so. Tim did the same thing... although he was hard to understand when he was drunk! Anyway, my point is that writing is a LONG process - maybe longer for me than for some other authors - and I just settle in for the ride. Sometimes I feel impatient, but the plot, the story, the characters need time to figure out who and what they are... and I need time to translate that into a fully developed story. And on that note, I just want to add that the plot is SUPER important to me. Beyond my characters, I try my hardest to place them in an adventure that is twisted, imaginative, and forces them to grow or, sometimes literally, to die. I hope more than anything that when you finish Pandora's Key you've taken the journey with Evangeline from who she was to who she is and that all the twists and turns she faced surprised you as much as they did her... and sometimes even me. And now, Nancy has kindly provided some ebooks for giveaway. This book looks awesome. Can't wait to read it. Love that it started as a screenplay! Sounds fabulous. Thanks for sharing!